By noticing and getting to know our patterns, we untangle from the bind of automaticity. What do you notice when you practice meditation? Most people find that their minds won’t stay still. Attention is drawn away, again and again, into thoughts, feelings, sounds, sights, smells—into anything except where we meant to put it. It’s tempting to view this as a problem that mindfulness practice will rectify—if we train ourselves to keep coming back, won’t we soon be able to focus more easily? Perhaps. But something else may be happening too. If you’ve discovered that you’re not fully in charge of your mind, you might like to ask yourself: How do I know this? How have I realized that the mind is distracted? And how am I able to bring it back? In order to notice that the mind has wandered, and be able to return it to attention, there must be something bigger than that mind, a wider perspective that can observe the distraction. That wider perspective is awareness. Awareness sees the whole picture. With it, we can experience life with a more open lens. We might think it’s a bad thing to notice the mind drifting, but actually the reverse is true. The fact we can see it means we’re opening to greater consciousness. It’s true that in mindfulness practice we’re cultivating a capacity to attend with greater stillness, stability, and strength. But with awareness, we can discover a way of being that isn’t caught in the reactive jumble of thought, sensation, and impulse, even when attention is drawn to it. Imagine a cow standing in a very small field, hemmed in by fences. With little space, the animal is stuck—it can’t move freely, and it probably feels claustrophobic, angry perhaps, or frightened. Now imagine that the field is made bigger—the fences get moved back, and there’s more room to roam. Chances are the cow will be a lot more content. We don’t have to try to make awareness happen. It emerges naturally from our willingness to disengage from automatic patterns of thinking, feeling, and reacting, such as when we practice in meditation. By opening to awareness, we’re expanding the field of perception. Without having to try to change the mind, the very space we offer it can bring release. Instead of being caught in thoughts, sensations and reactions, we find some room to breathe. We discover a space in which to see what’s happening. As it’s easier to care for the cow in its more expansive field, so it’s easier to handle the wandering mind in the wide-open space of awareness. We’re called back to awareness when we notice the mind has wandered. Every noticing and every coming back inevitably happens in awareness. From this perspective, mind wandering isn’t a problem—indeed, noticing it means we’re starting to see our habitual patterns of perception more clearly. With awareness, we start to see that thoughts are just thoughts, sensations just sensations, sights just sights, and sounds just sounds. We can choose to take these as the basis for interpreting the world, or we can decide to experience them as interesting phenomena, arising in the mind and body. By noticing and getting to know our patterns, we untangle from the bind of automaticity. This process is usually a gradual one. We need reminders to come back to awareness again and again. These reminders to wake up are built into mindfulness practice: over time, as we train in noticing and coming back to experience, we can shift from a place of unconscious habit to a place of clearer seeing. This shift can be allowed to happen gently—one moment at a time. 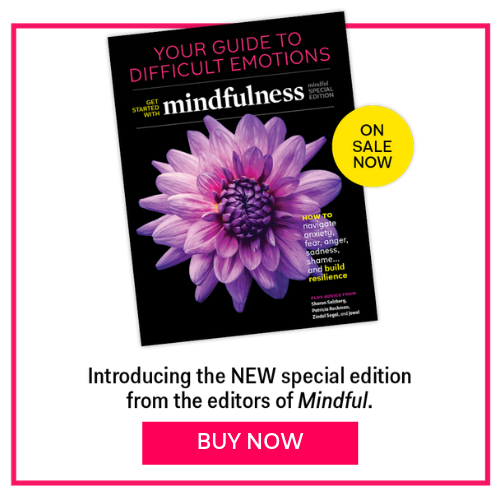 Excerpted from Mindfulness: How To Live Well By Paying Attention, by Ed Halliwell, published by Hay House.